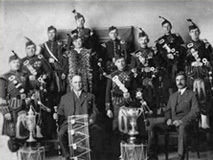 With over 99 years under our belt, the Winnipeg Police Pipe Band has been a focal point for the city of Winnipeg and beyond. 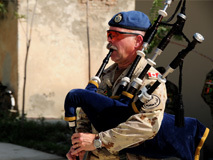 Many years of experience allows the Winnipeg Police Pipe Band to produce magnificent sound. We play one of the loudest instruments on the globe - so it has to be just right! With permission of Her Majesty Queen Elizabeth II, we wear the Royal Stewart Tartan. We can perform in our Full Dress uniform to enhance your event! Our band members' travel all over the world. 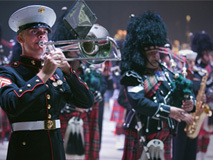 We have entertained audiences in Afghanistan, France, Ireland, Las Vegas and Scotland! 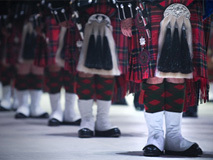 The spectacle of the Pipes and Drums will add something special to any function. Spice up your event with our Pipe Band! The Band is looking for new members. Get in touch with us to find out more. Give us a call. Sometimes it's best to hear a voice on the other end of the line when you are planning something big.